A whitelist is a list of e-mail addresses or domain names from which an e-mail blocking program will allow messages to be received. E-mail blocking programs, also called a spam filters, are intended to prevent most unsolicited e-mail messages (spam) from appearing in subscriber inboxes. But these programs are not perfect. Cleverly crafted spam gets through, and a few desired messages are blocked. Most Internet users can tolerate the occasional unsolicited e-mail advertisement that a spam filter misses, but are concerned by the thought that an important message might not be received. 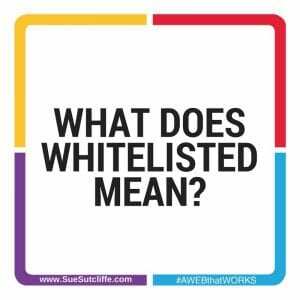 The whitelist option is a solution to the latter problem. Previous Previous post: Why host with aWEBthatWORKS.com? Next Next post: What is a false positive?